Have you ever noticed that, in Miami, everything that’s old becomes new? The Miami Art Museum is being transformed into the Jorge M. Pérez Art Museum of Miami-Dade County. The park in which the museum sits is morphing from Bicentennial Park (on Biscayne Boulevard) to Museum Park. In case you are wondering it is also located in front of Ten Museum Park and Marquis in Downtown Miami. 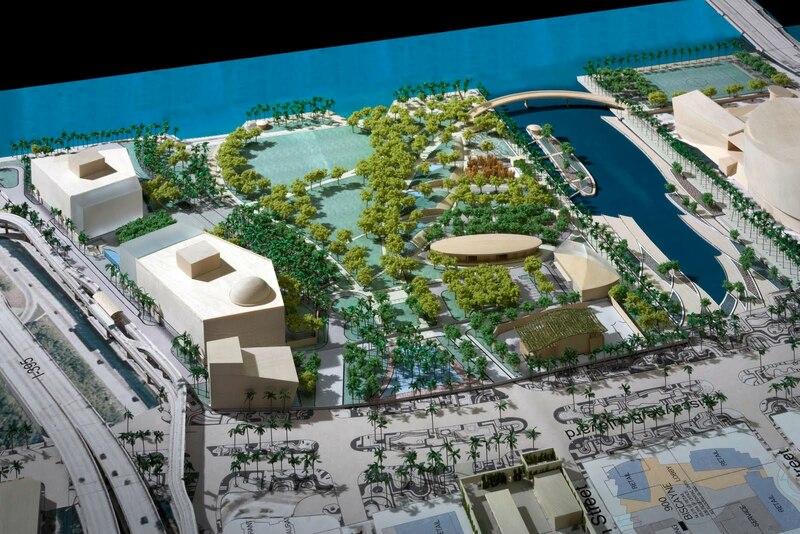 The Museum Park dream – that highly anticipated and amazing green space filled with gardens, majestic palm trees, pools and glass pavilions – while not dashed, has been drastically scaled back. The reason? The same we’re hearing from cities across the country: a money crunch. The project has been scaled down from a $68 million mega park to a bare-bones $10 million one. The current budget for the project covers some green areas and a bay walk and promenade running from Biscayne Boulevard to the Bay, according to the Miami Herald’s Andres Viglucci. Although it will be a lovely and functional park, it “will not have that Millennium Identity,” according to city Commissioner Marc Sarnoff. The good news in the area is that new Perez Art Museum is still on track and the project is half finished – slated for completion in about a year. Backers promise a world-class museum. The museum’s namesake, real estate billionaire Jorge Perez, plans on donating bits of his personal collection of Latin American art – a bequest worth an estimated $40 million. Taking a peek a little further into the future finds the new Miami Science Museum ready to open its doors in late 2014. Connected by a wide plaza to the Art Museum, the Science Museum project broke ground in February. If you’d like to follow the project you’ll find a construction cam live feed at the Miami Science Museum’s website. With a pending opening date of 2015, the 250,000 square foot museum will make the list of sustainable science museums by harnessing solar and wind for the building’s energy needs. Permanent exhibits will include a 600,000 gallon shark-filled aquarium, a 3D planetarium, technology exhibits with which the public can interact and cafes and gardens so you can make a day of your visit.